After the Yankees stranded runners at first and third with no outs in the bottom of the sixth, the stage was set for Javier Vazquez to wilt. And, sure enough, the Orioles immediately staged a rally against the Yankees’ righty, placing runners at second and third with one out. At that point, Girardi faced a critical decision in the game. Instead of going to the bullpen, the Yankee manager opted to intentionally walk switch hitting Matt Wieters and let Vazquez go after the right handed hitting Adam Jones. Like Vazquez, Jones has had a trying 2010 season in which he has fallen well short of the expectations promised by his 2009 campaign. In many ways, the confrontation between Vazquez and Jones represented a cross roads for both players…a moment that has the potential to serve as spring board into the coming summer months. From the first pitch of the at bat, Vazquez seemed as if he knew exactly how he was going to get Jones out. A first pitch slider hit the outside corner for a strike, and then a changeup followed inside off the plate. With the count even at 1-1 and the possibility of another off speed pitch in Jones’ mind, Vazquez went back outside with a 90mph fastball that hit the corner for a strike. Instead of wasting a pitch on 1-2, Vazquez went back to the change, again just over the inside part of the plate, prompting Jones to swing over the pitch. As Cervelli pumped his fist, it seemed as if Vazquez grew three feet taller. There was still one more batter left to get, but Julio Lugo swung at a first pitch change and grounded into a 6-4 force to end the inning. As he walked off the mound, the crowd, which moments earlier had groaned, now cheered, giving Vazquez his first positive moment in Yankee Stadium in seven years. Although it sure seemed like Vazquez was walking off the mound triumphantly, the score was still tied 1-1. In already his third start against the Yankees in 2010, with each one better than the next, Brian Matusz matched zeros with Vazquez until the bottom of the fifth inning, when Curtis Granderson launched a homerun into the right field stands, notable not only because it gave the Yankees a lead, but also because it came off a left hander. The Orioles got their young lefty even in the very next half inning, however, when Vazquez left a fastball over the middle of the plate to Corey Patterson, who blasted his third homerun of the season. The Yankees game winning rally in the bottom of the seventh inning was somewhat anticlimactic coming after Vazquez’ Houdini act in the top of the inning, but as usual, it centered on Alex Rodriguez. After a Juan Miranda groundout moved Nick Swisher and Derek Jeter up to second and third, respectively, Orioles manager Dave Trembley had his very own crossroads decision to make. Instead of walking Arod and having his young lefty face the scorching hot Robinson Cano, Trembley summoned reliever David Hernandez to go right after the Yankee slugger. At first, the move seemed to pay dividends when Arod hit a routine groundball to Miguel Tejada, but as he has done all season, the Orioles’ third baseman bounced his throw to first. After Ty Wigginton, another Orioles’ defender playing out of position, was unable to come up with the throw, the ball bounced off Arod’s foot and rolled up the line, allowing Swisher to score a second run on the play. 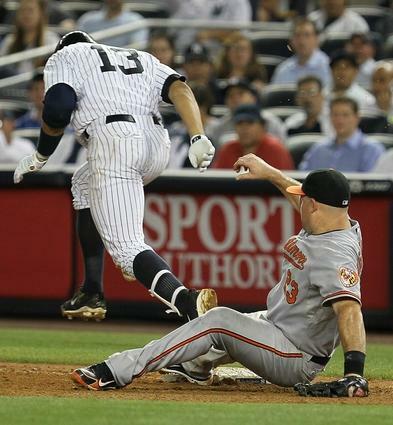 The Orioles gift not only gave the Yankees the lead, but also made Vazquez the pitcher of record. However, the Yankees still needed to run the gauntlet of their bullpen. In his first appearance since surrendering four runs to the Indians on Saturday, Chamberlain was much more aggressive and needed only eight pitches, all fastballs ranging from 94mph to 98pmh, to retire the side in order. Mariano Rivera then came on to close out the game in the ninth, brandishing his signature cutter at a more Mariano-like 91-92mph. One negative event from the game occurred in the bottom of the third inning, when Mark Teixeira fouled a ball off his left foot and then had to be removed from the game. X-rays taken during the game were negative, and Teixeira is listed as day-to-day. In his postgame comments, Teixeira stated that he expects to play on Wednesday. If so, he may also be joined by Jorge Posada, who is eligible to return from the disabled list and has pronounced himself fit to play.